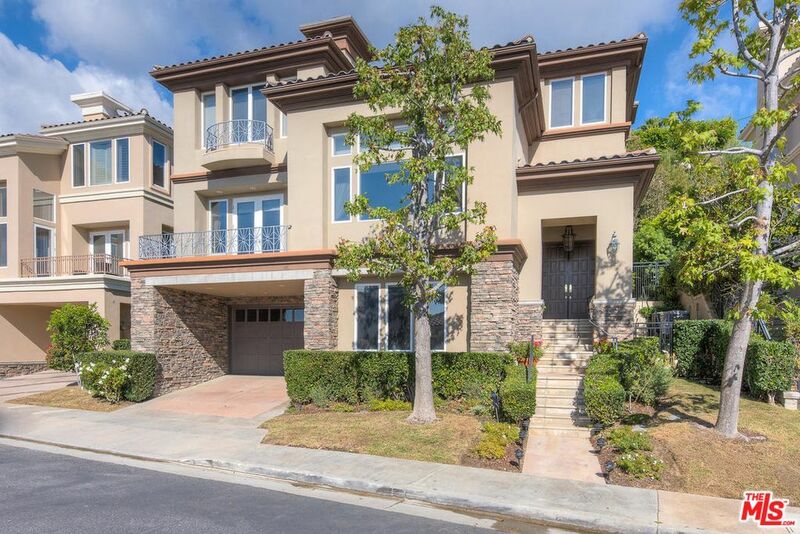 Spectacular, gated 3-story Mediterranean with ocean/mountain views and elevator. Fabulous lower level features in-law/teen/maid’s suite, media/play room, and laundry room. Gorgeous kitchen with Viking refrigerator, ovens, microwave. Crema Marfil marble floors in kitchen and breakfast rooms. Black Beauty granite island with eating area and amazing view to private back garden with Lynx deluxe outdoor kitchen with gas grill, refrigerator, storage. Seating area surrounds outdoor fireplace. Upstairs: master, 2 additional bedrooms and office (can be converted to 5th bedroom). Luxurious master with fireplace and ocean/mountain views. Stunning master bath with new built-in vanities and cabinets. Large shower and Air Spa tub. Charming family room with fireplace. Living room with fireplace and formal dining room, both open to balcony with views. Cappuccino maple hardwood floors and stairway. Double garage – 4 car tandem. Allergy filter on HVAC. Cir. pump/timer on water heater. Summit Club membership with pool, tennis, clubhouse, playground, and basketball. Gated dog park.